That heavy snowfall we had in March really made things worse, bending my existing supports and forcing the culms that were not already leaning into a more leaning habit. So since then I've put up with a plant that is taking up way too much space. 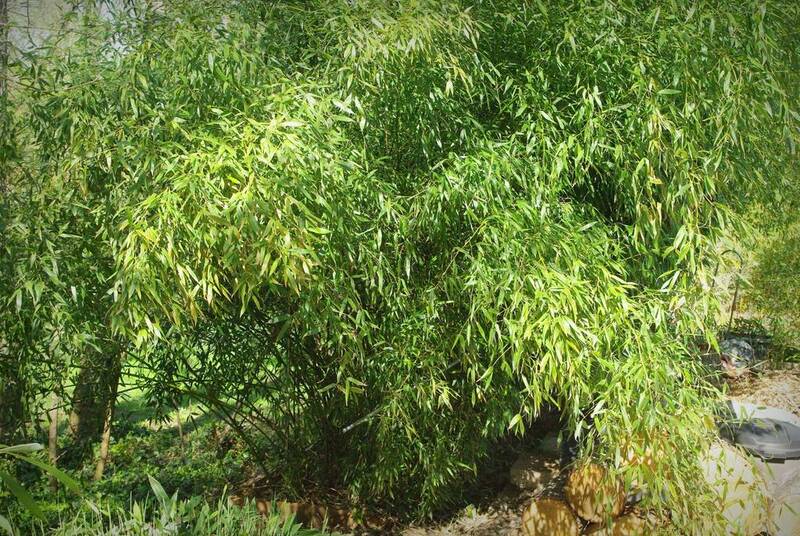 Once those shoots get taller I won't want to be pushing, pulling, and messing around with this plant too much -- those shoots and young culms are too tender and are easily broken. So the time to act is now! 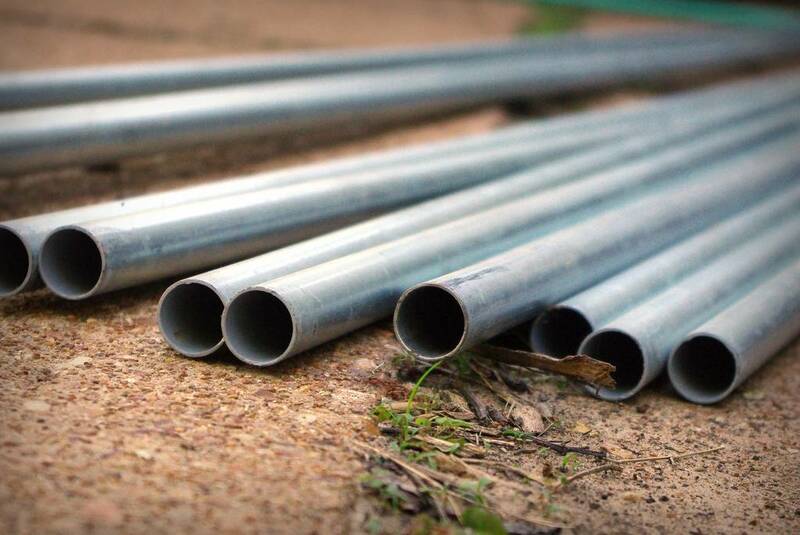 The plan is to bolt the new structure together for a tighter connection than the hose clamps could provide, and I was concerned that I'd have problems drilling through the pipes after they were pounded into the ground. This ended up being a little bit of a problem during assembly, but more on that soon. It's completely safe, as long as you don't use the rotten boards -- but you don't know which ones those are until you step on them. You know what makes standing on a ladder that's atop a half-rotten pallet balanced on two rough-cut log sections more exciting? 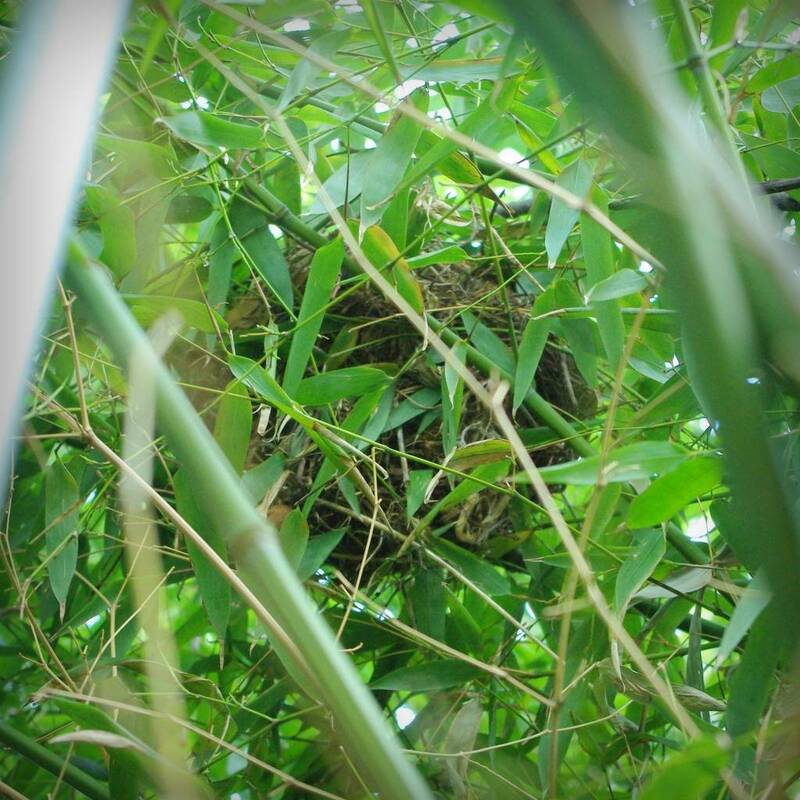 A bird nest very near your face. 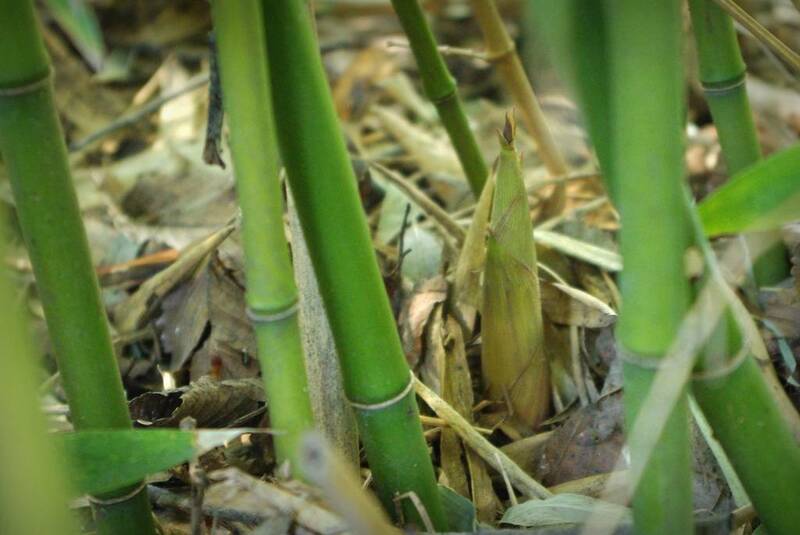 There were eggs in there -- I checked -- so I was expecting to get swooped or even pecked, but no parents bothered me. I suspect it was a Grackle nest. And that's where I stopped on Saturday, as that pounding was exhausting! Maybe I should explain my technique for "installing" vertical poles. Usually I'll just balance the pole upright -- that tells me it's not leaning in any direction -- then I'll grab onto it and use my weight to push it into the ground a bit, being careful not to lean it in the process. I'll then check it with a post level (which has two bubble levels perpendicular to each other -- when both bubbles are centered, the post is vertical) and if it's not too far off I'll get up on a ladder and pound it the rest of the way in. If it has shifted when I measure I'll pull it out, move it a couple inches and try again. 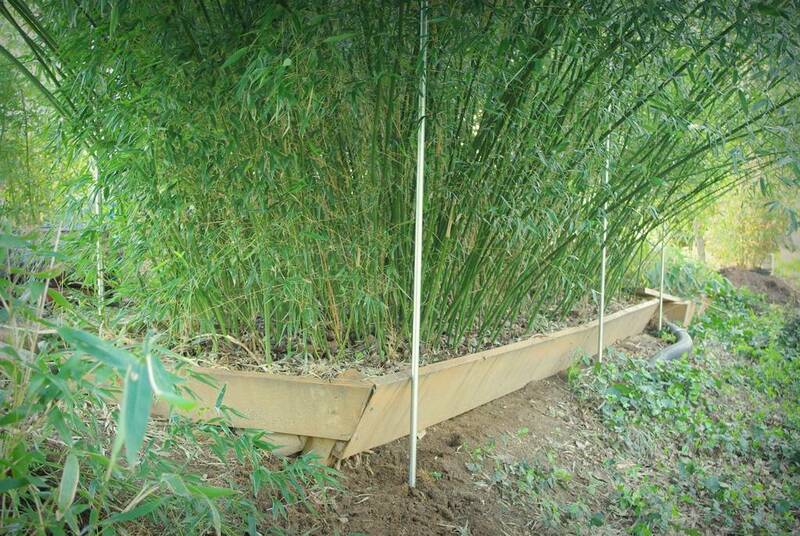 Since there was bamboo in the way I had to rely on the post level from the start, as balancing was not possible. Sunday morning (after a quick, cold-morning diversion to a local nursery to buy a couple of plants) I measured the spacing between the posts, cut all of the pipes for the horizontal members, and drilled them. Then I started installing and realized what the problem with pre-drilling was: accuracy. 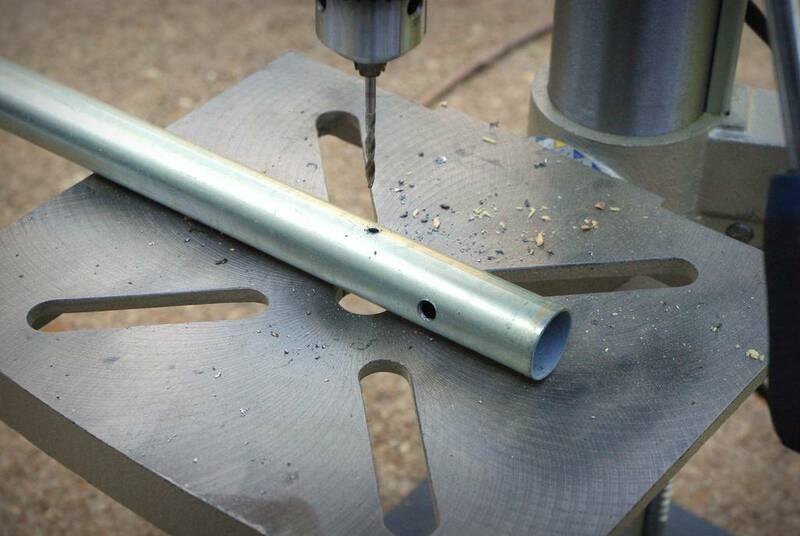 Even though I was using a drill press, I didn't have a way to hold the pipes in position when drilling, so sometimes the holes went through at a slight angle. 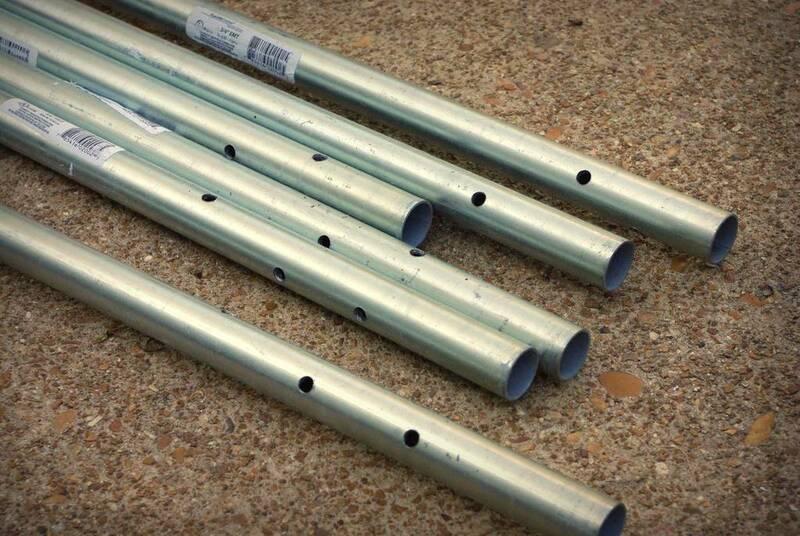 When two of these "angled" holes were lined up they created a slight zig-zag, instead of being a straight line through both pipes. Since you can only buy straight bolts, I had to use the hand drill to enlarge some of the holes so that the bolt could fit through. 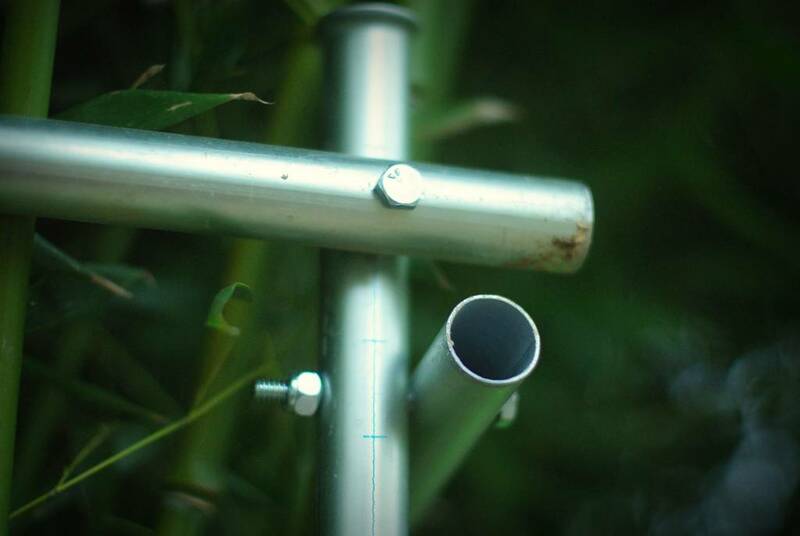 This sounds pretty easy, until you remember that on some of these I only discovered this problem while the pipes were holding up the weight of dozens of bamboo culms. 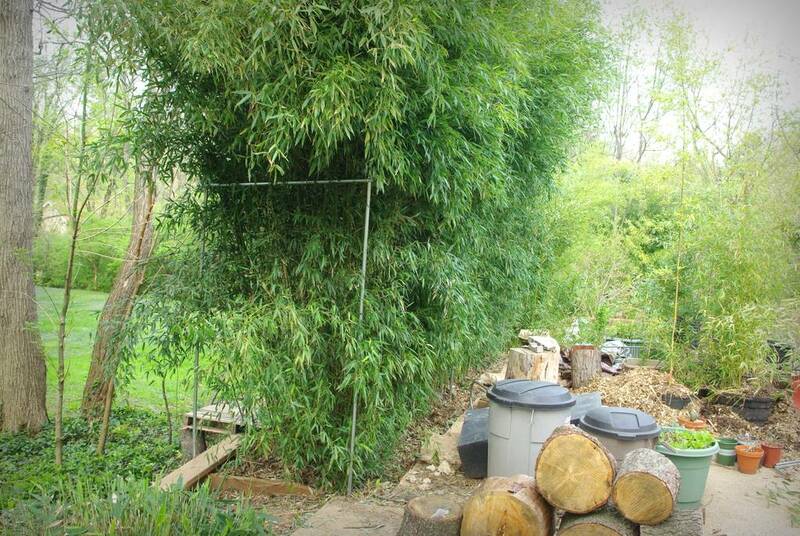 Since I was holding the pipe (that were holding the bamboo culms), it ended up being a pretty strenuous step. I'm still not convinced that this support system won't get destroyed by another heavy snowfall or ice storm, but I do have the next version of this cage already designed in my head, and it will be a permanent solution involving heavier pipes and welding. 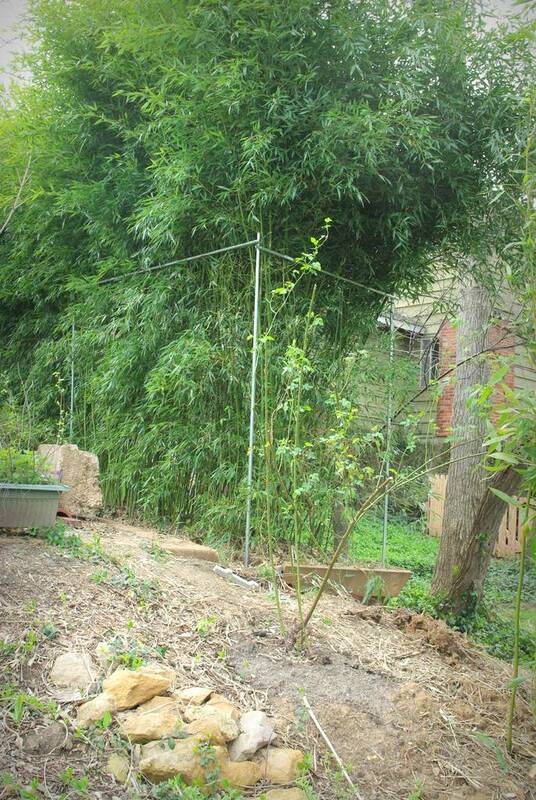 I'm hoping I won't need to do that though, and that this cage will last a couple of years until the bamboo is more capable of holding itself upright. I'm glad to have it taken care of for the time being though. Now I can enjoy watching the shoots grow! Note: I'll pull some of the branches out to hide the horizontal poles a bit more, but I was too tired to spend time on that now. 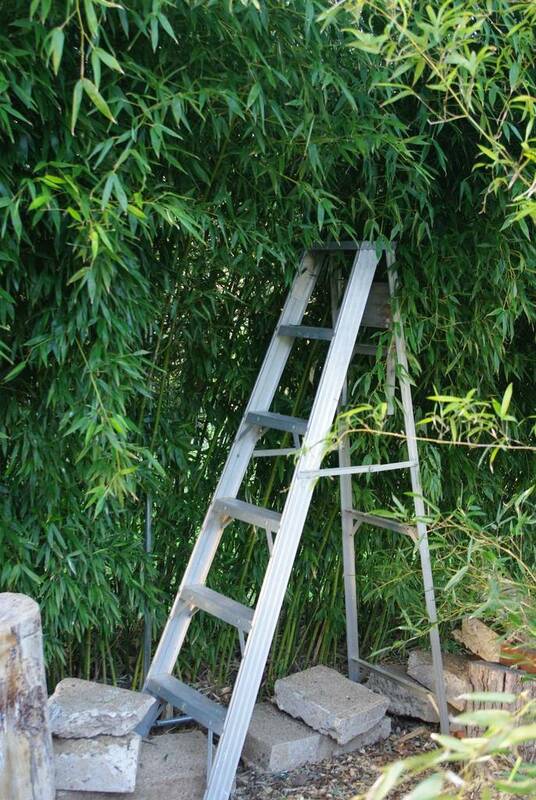 I admire your dedication to your bamboo - it's definitely not a plant that should be attempted by the gardener looking for easy maintenance! It is beautiful, though - well worth the effort! Whew...I'm exhausted just reading this post...but you're so right, NOW is the time to take such measures...all too often, I wait too long and then the garden is "flopville". As Lisa said, your dedication is amazing. 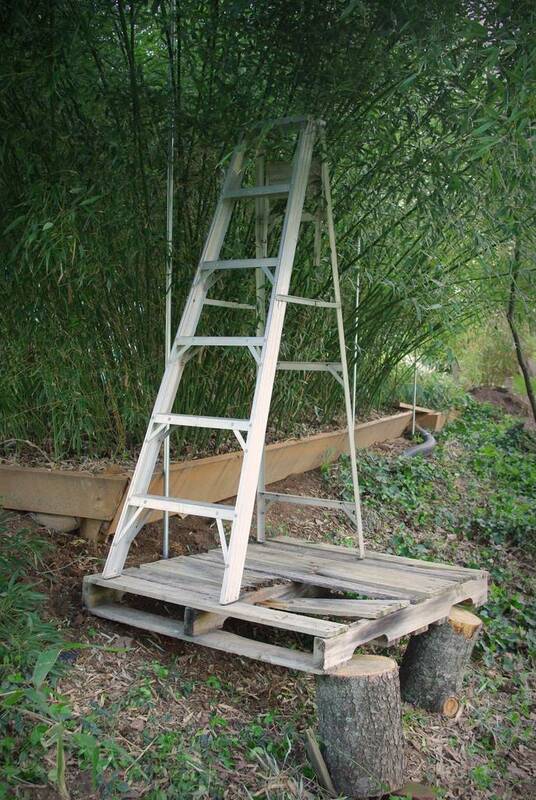 Me, I'd just let the bamboo flop and curse it :-). Gerhard: you'd chop the wayward culms instead. I was considering it, but that would thin out 75% of the growth, and I'm certainly not going to do that! OMG, that is hard work, as Scott said above i'm exhausted just reading. But i appreciate the lushness of your Oxygen Generators. 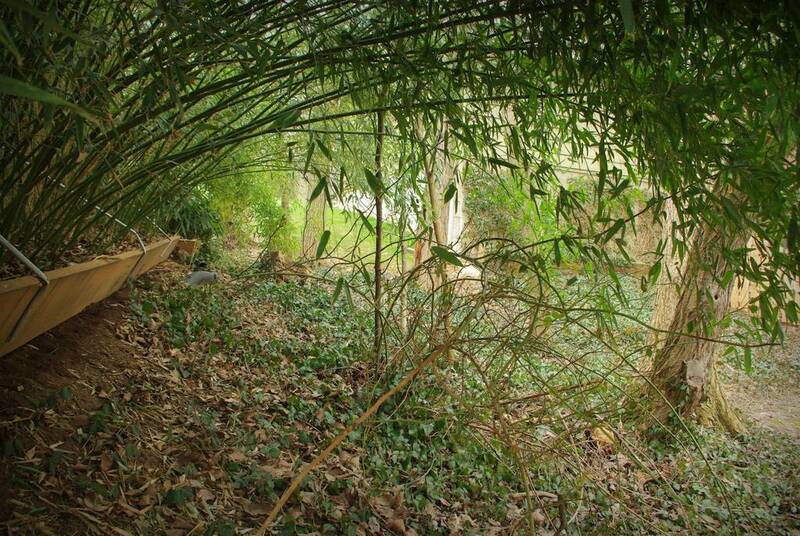 You already have a bamboo forest, something to give the world your share. How is your new metal cage holding up this winter? I'm sorry to hear that, I was inspired by your design and hoping to do something similar myself. 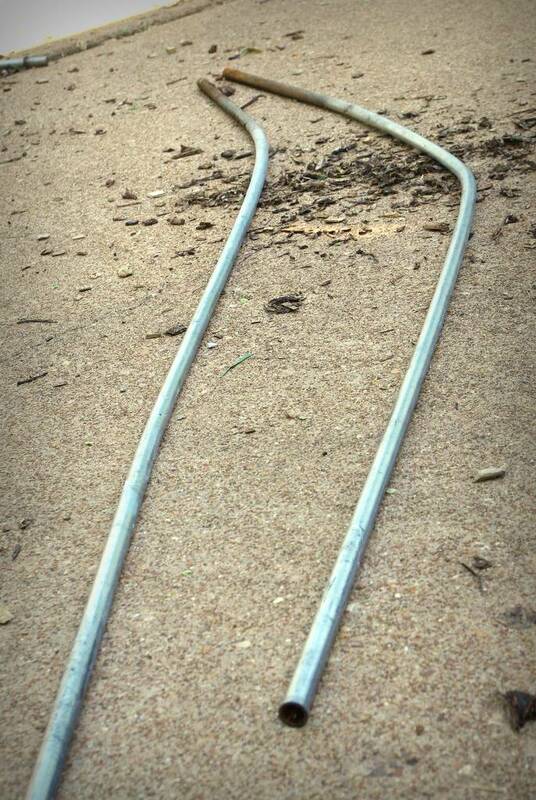 Do you think rebar would work? How far apart are your vertical supports? 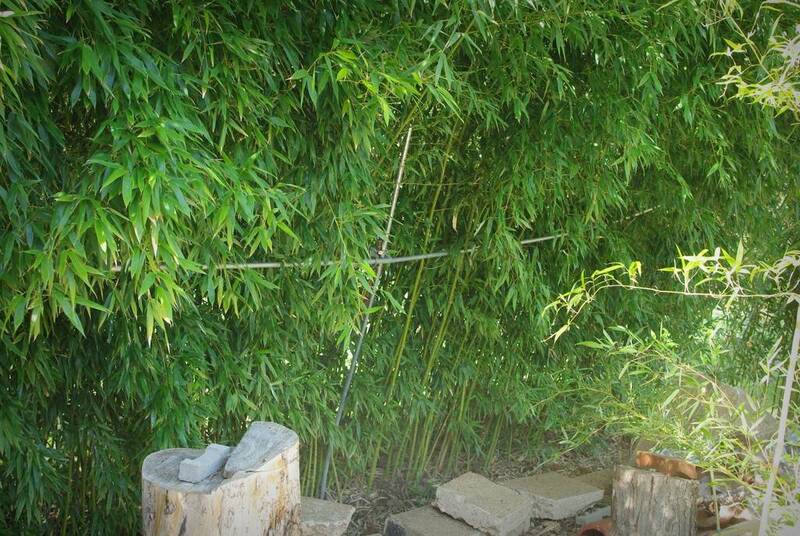 There's just too much bamboo mass in there, it exerts too much force on the cage when the bamboo is wet or covered in snow. 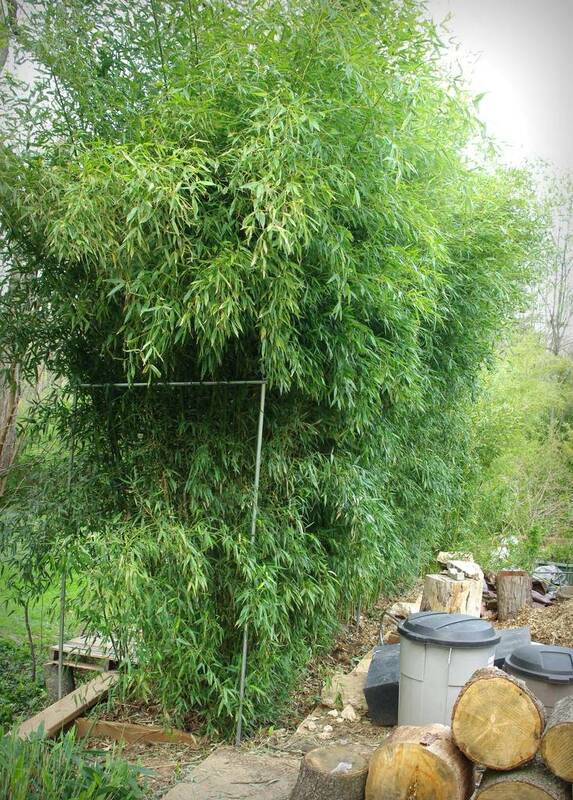 As the culms get larger, this may be less necessary -- give it a try! The supports are about 10' apart. Thank you for the encouragement. 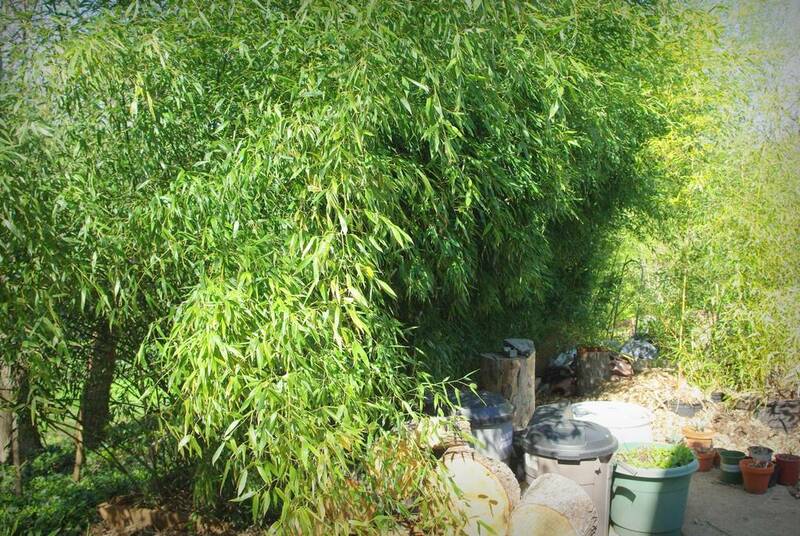 I have black bamboo that is about 10 years old, and it still leans waaay over when it's wet or snow-laden. 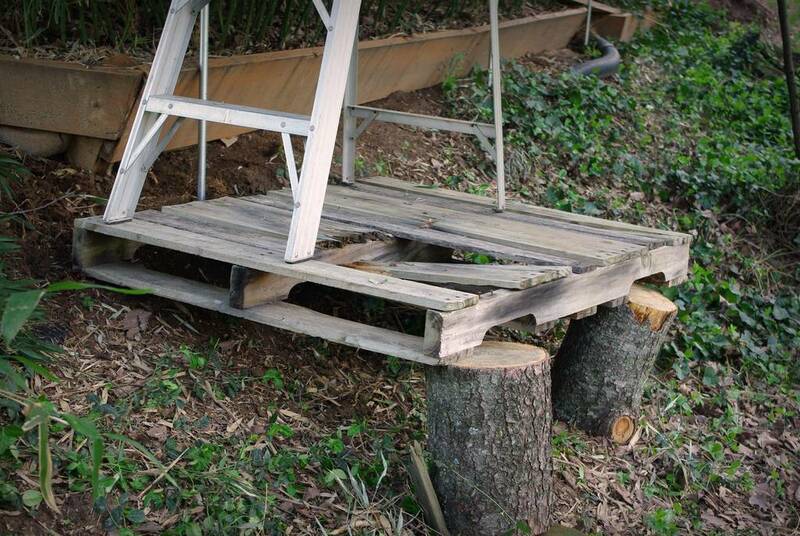 I'll try something along the lines of your cages this year and let you know if I come up with a workable fix. Thanks again.